Method describe behavior of an object. A method is a collection of statements that are group together to perform an operation. Modifier : Modifier are access type of method. We will discuss it in detail later. Return Type : A method may return value. Data type of value return by a method is declare in method heading. Method name : Actual name of the method. Parameter : Value passed to a method. Method body : collection of statement that defines what method does. While talking about method, it is important to know the difference between two terms parameter and argument. Parameter is variable defined by a method that receives value when the method is called. 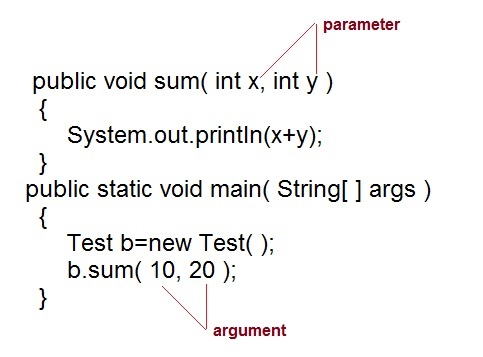 Parameter are always local to the method they dont have scope outside the method. While argument is a value that is passed to a method when it is called. call-by-value : In this approach copy of an argument value is pass to a method. Changes made to the argument value inside the method will have no effect on the arguments. call-by-reference : In this reference of an argument is pass to a method. Any changes made inside the method will affect the agrument value. NOTE :There is only call by value in java, not call by reference. If two or more method in a class have same name but different parameters, it is known as method overloading. Overloading always occur in the same class(unlike method overriding). Note: Overloaded method can have different access modifiers. cal.sum (8,5);      //sum(int a, int b) is method is called. cal.sum (4.6f, 3.8f); //sum(float a, float b) is called. You can see that sum() method is overloaded two times. The first takes two integer arguments, the second takes two float arguments. Method overloading by changing no. of argument. ar.find(8,5);     //find(int l, int b) is method is called. ar.find(4,6,2);    //find(int l, int b,int h) is called. In this example the find() method is overloaded twice. The first takes two arguments to calculate area, and the second takes three arguments to calculate area. When an overloaded method is called java look for match between the arguments to call the method and the method's parameters. This match need not always be exact, sometime when exact match is not found, Java automatic type conversion plays a vital role. Example of Method overloading with type promotion. ar.find(8,5);     //automatic type conversion from find(int,int) to find(long,long) . ar.find(2,4,6)    //find(int l, int b,int h) is called.